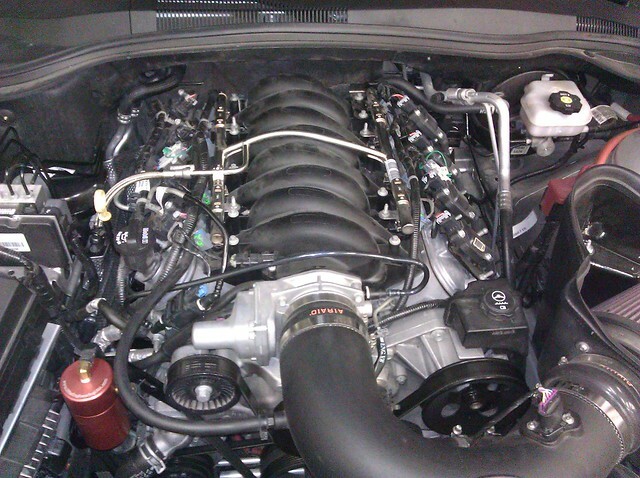 This retrofit of a new fuel line is an excellent way of making your engine bay cleaner and look more like a muscle car engine bay! 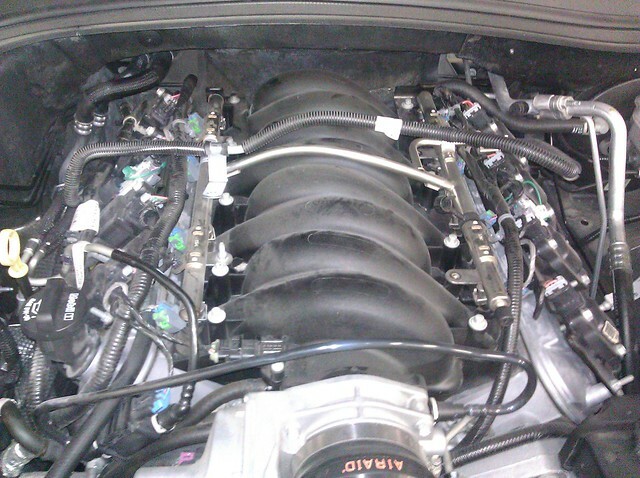 This, in addition to the JDP Motorsports' 2010-11 SS Heater Hose 2012 Update will make your Camaro SS's engine bay look the best on the block, with an actual good looking engine staring at you! Remove the engine cover (if present) by removing the oil filler cap, lifting the front of the cover, and pulling forward and up. Reinstall oil cap. On the passenger side of the engine, you'll see where the fuel line connects to the main body fuel line. Remove the clip that holds it locked on. Using a screw driver to pop the top part out, then push down and out to completely remove. 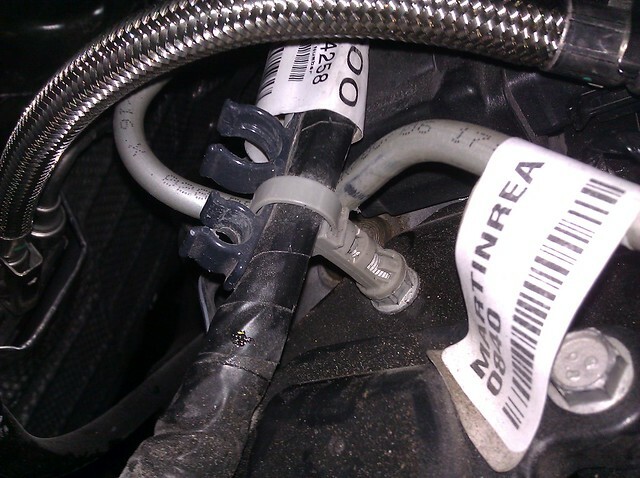 Using the AC/Fuel line tool, disconnect the engine fuel line from the main fuel line. 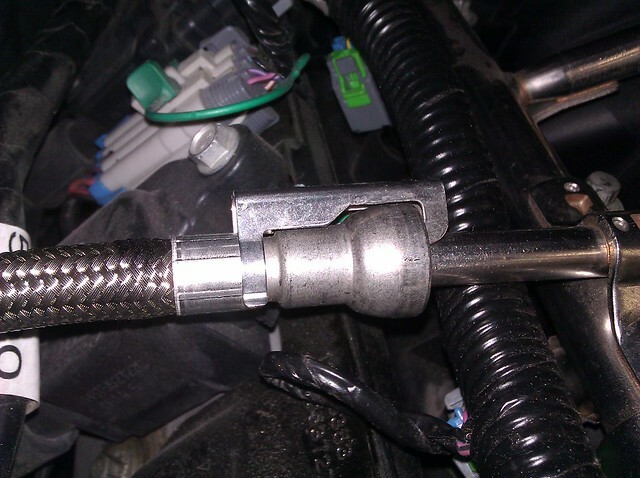 Insert the tool onto the line, push tool into the connection fitting, push the engine fuel line into the tool, then pull the engine fuel line out and off. Fuel will spill out, so you can have a rag or something to catch it, but it will evaporate quickly. 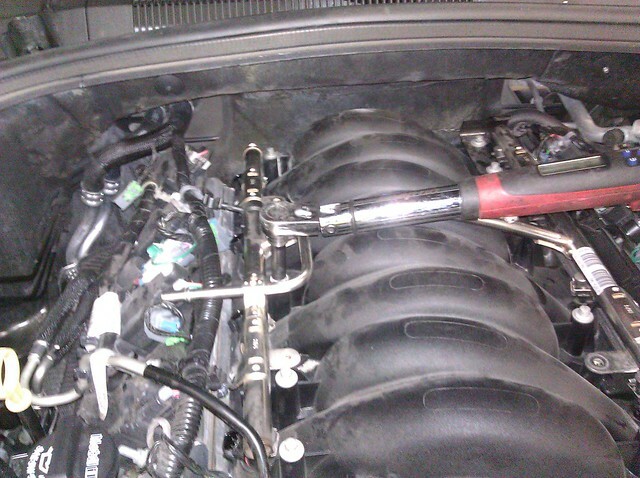 Just make sure you don't drip it onto the coils, spark plug wires, or headers. Position the line to allow it to continue dripping safely. 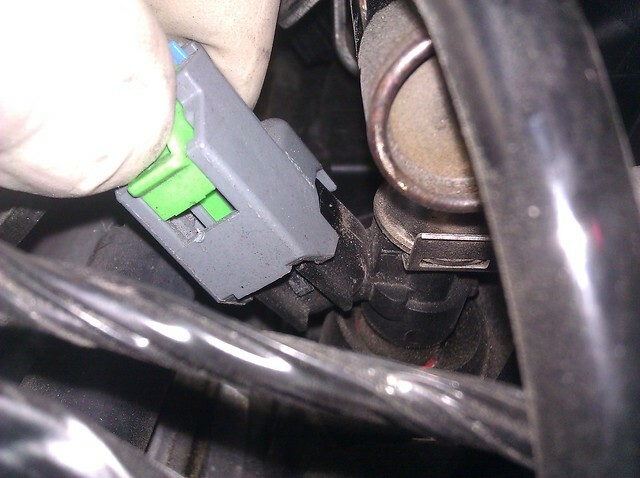 Now with a 10mm deep socket, remove the nut holding the fuel rail on the passenger side of the intake manifold, and unclip the plastic clip on the drivers side. 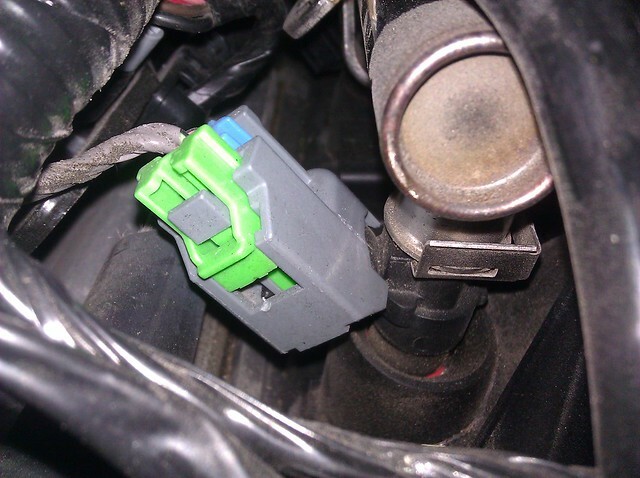 Now disconnect the fuel rail at engine, on the drivers side using the same method. You'll want to use a rag to catch the fuel that comes out (there will still be a lot). 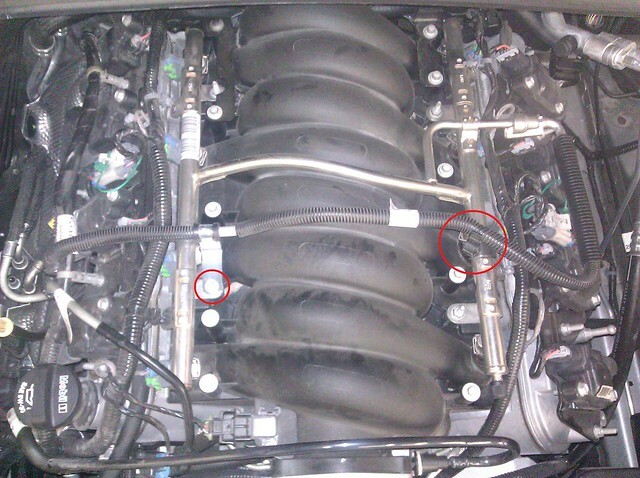 You don't want fuel to get on the coils if at all possible. 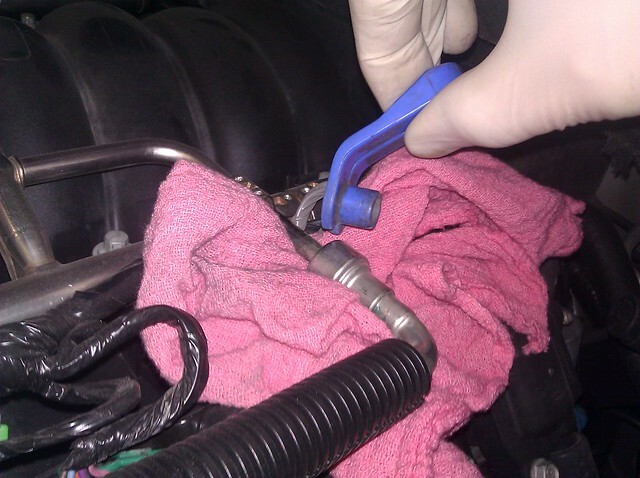 When the rail is completely disconnected, leave the rag there, as fuel will continue to come out of the rail, and remove the rail completely, taking care to not spill fuel. 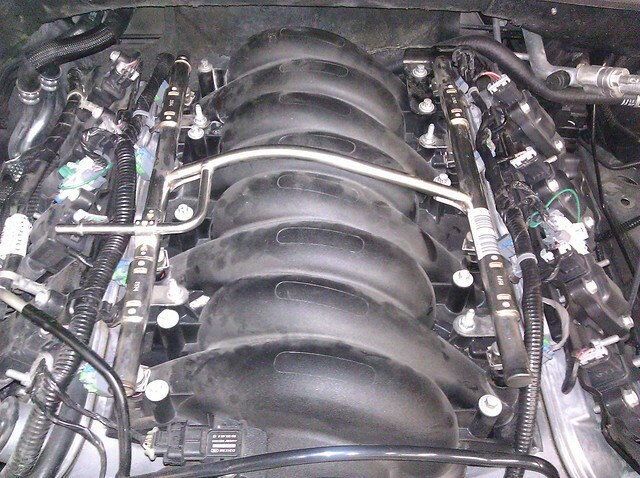 The injector wiring harnesses are attached to the fuel rail at 4 points, two on each side. Pop these attachments out of the fuel rail. Most will just pull out, but you can use a tool to pry them out easier. 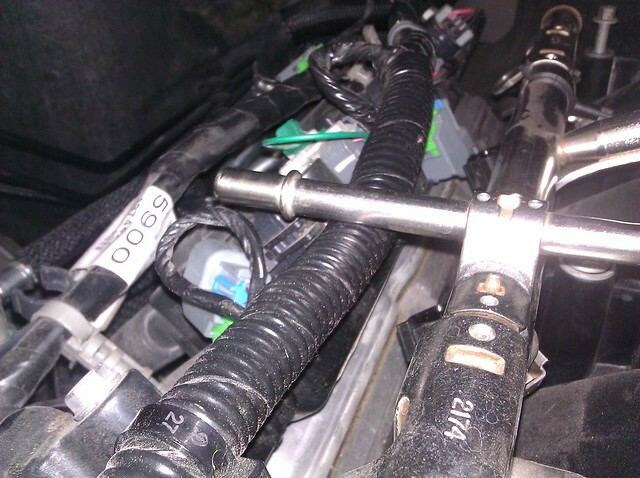 Now disconnect all fuel injector electrical plugs. First, slide the lock upward. Then push the button, and pull off. 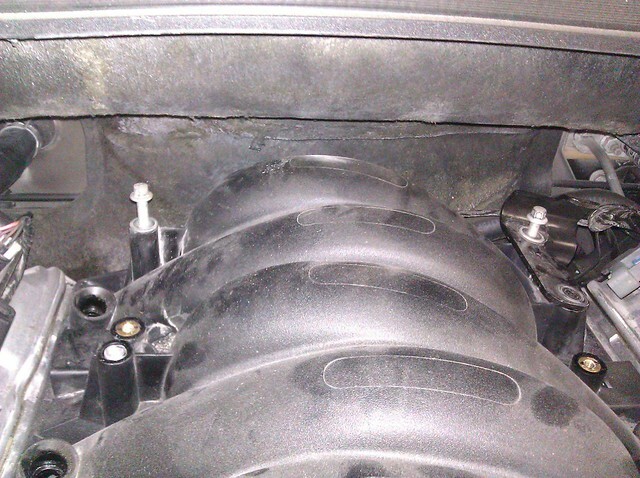 Now with an 8mm socket, completely loosen the 4 rear bolts on the intake manifold (2 on each side). Now remove the fuel rail by removing the 4 10mm bolts that hold the fuel rail, then wiggle and pulling on the rails, if needed, you can gently pry the rail up with something, but ensure you don't crush whatever you pry against! The injectors will come with the rail. The rail will have to come out from underneath the rear brackets. 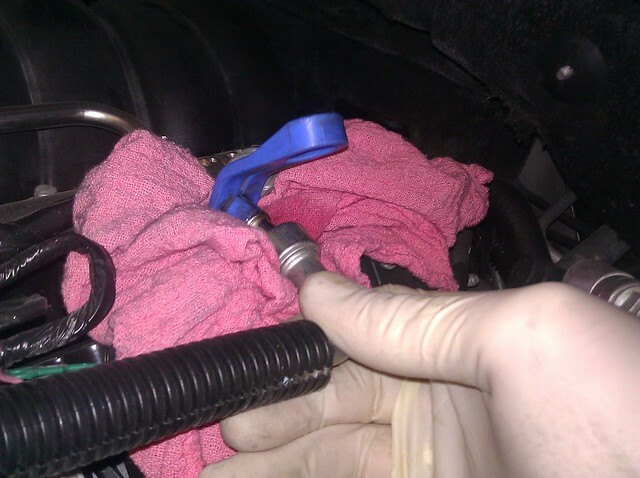 Make sure all injectors have the bottom o-rings on them; if any are missing, retrieve them from the engine (they will usually be sitting in the injector hole) and reattach to the injectors. 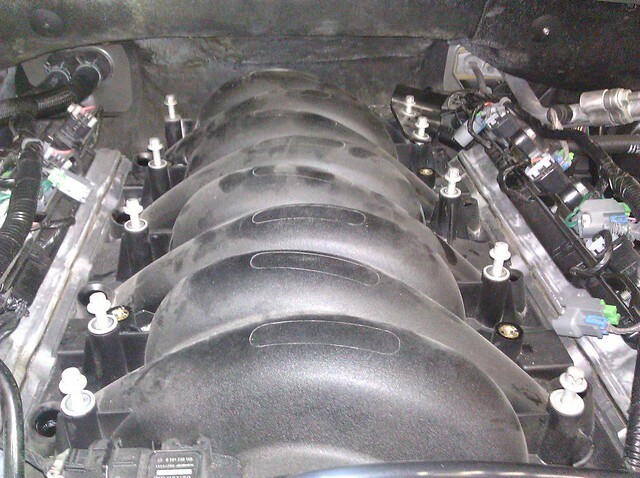 Now is the time to remove the intake manifold clam-shell cover if wanted. 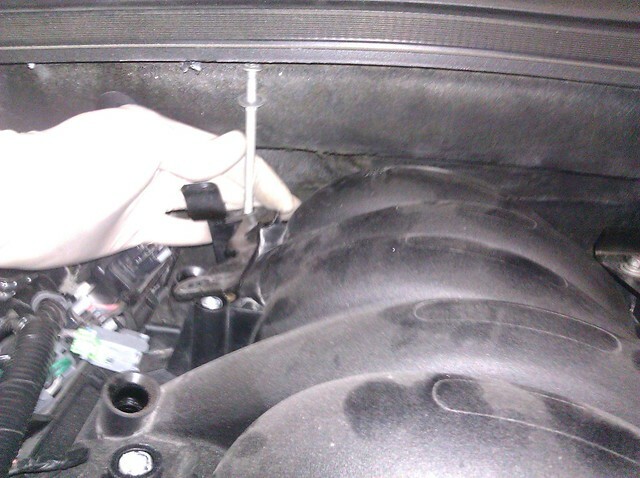 Now loosen and remove all intake manifold bolts. The rear 2 bolts will not come out. If you do not have a torque wrench available to you, you can feel how tight these bolts are, for later use. 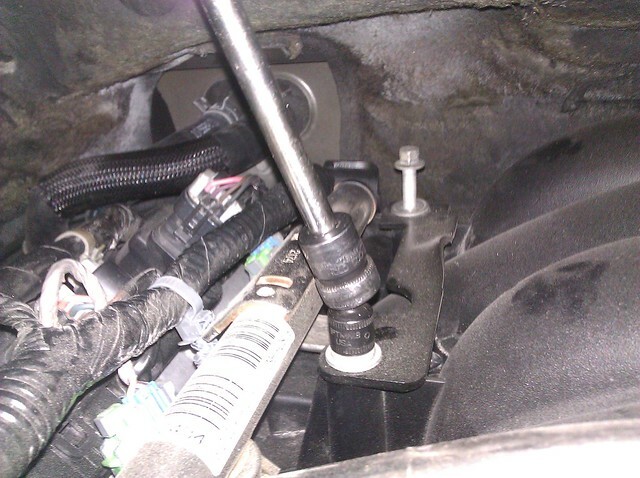 We now need to lift and pull forward the intake manifold a few inches, so disconnect the throttle body electrical plug, and if wanted or needed, remove the the intake tube from the airbox. I did not need to remove it on this car, but others may require it. Everything else seemed to give the needed length, but it may vary on other cars. Lift the back end of the manifold first, a couple inches up, then the front, then pull the manifold forward a few inches. We're looking for enough clearance for the rear manifold bolt on the passenger side to come out. 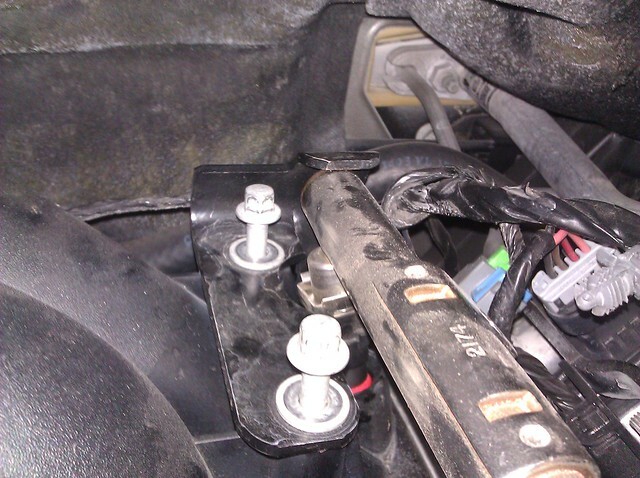 Once there, remove the bolt, remove the bracket it holds down, and reinstall the bolt in the same place. Leave the drivers side bolt and bracket as is. Once the bracket is out, and bolt back in place, move the manifold back to position, then set it back down on the engine, making sure all hoses, wires, etc are out from underneath the manifold. The biggest area of concern I could see is the front drivers side where a wiring harness could get caught underneath. After its sitting, I like to gently lift it all up, and drop it back down a few times, and listen for any odd sound. 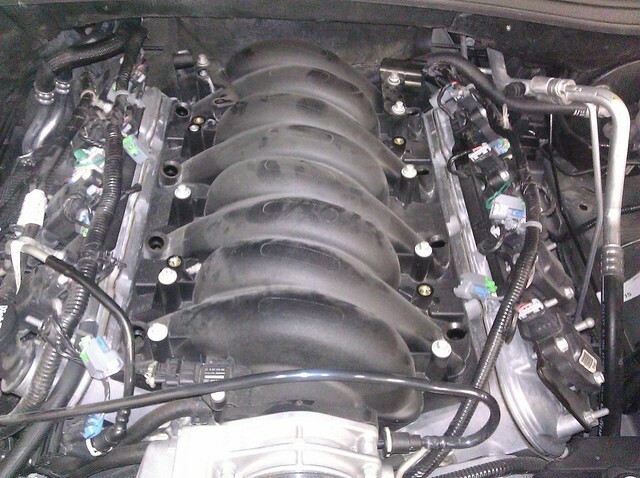 All the gaskets are rubber, so you should hear a soft thud, as opposed to any click, rattle, or anything like that. 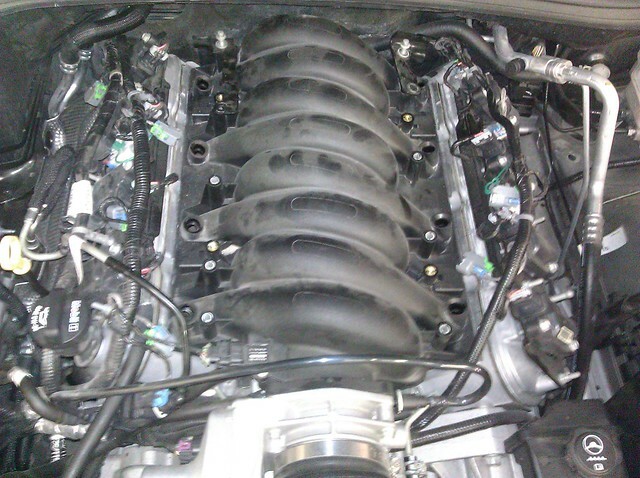 Now reinstall all manifold bolts, and screw them all in about half way, but do not tighten yet. 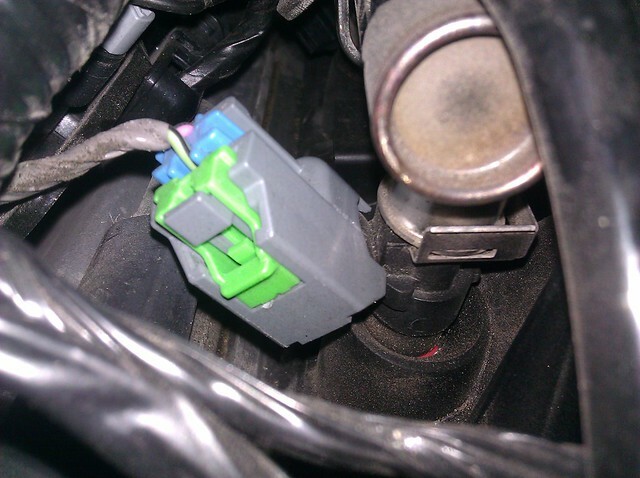 Also plug the throttle body connector back in. Reinstall the fuel rail assembly, but flipped around, so the fuel inlet is now on the passenger side, and the Schrader valve is on the passenger rear. 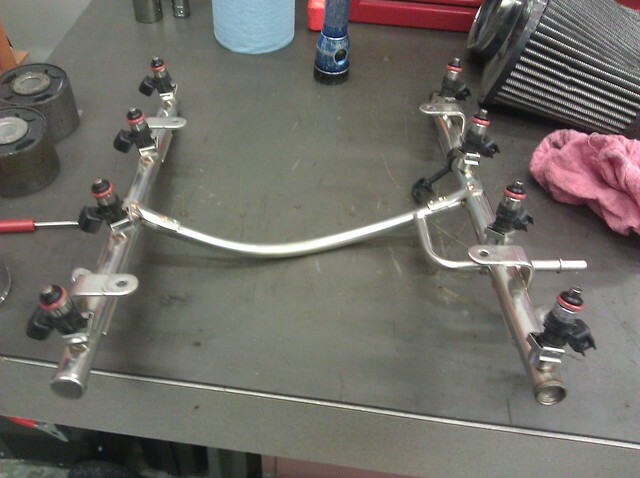 Take care to get the bracket on the drivers side over the fuel rail. 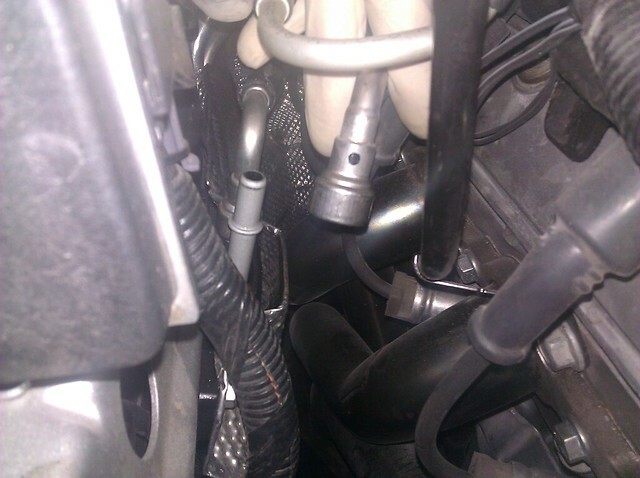 Make sure all injectors go into their hole, and pop into place. 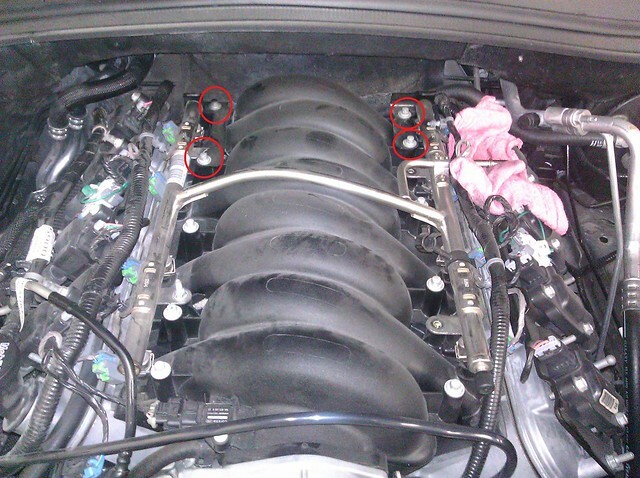 When down, you won't be able to easily see the o-ring on the injectors. 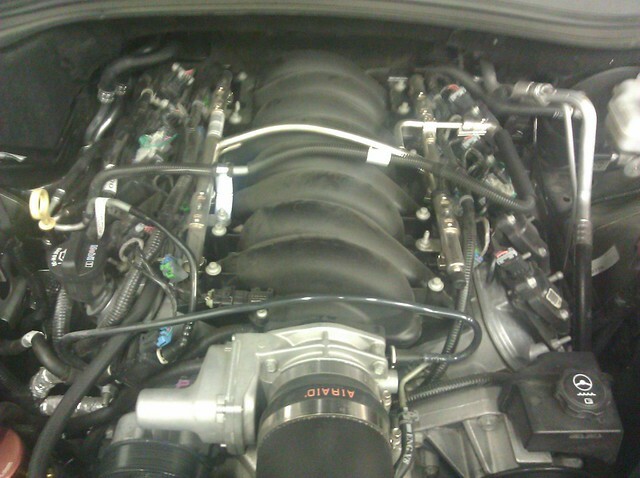 You'll want the fuel inlet pipe to sit above the injector wiring harness. Once completely down, you can install and tighten the 4 bolts that hold the fuel rail on to 89 inch-pounds, which is not very much! Then plug each injector connector back in, and lock each connector by sliding the tab down. Give them a gentle tug to make sure they are fully on. Now you can reconnect the injector wiring harness to the fuel rail, as previously removed in step 7. Now tighten all 10 intake manifold bolts in two passes, first pass all to 44 inch-pounds, second pass to 89 inch-pounds, in the specific order below. Again, these bolts are not very tight! 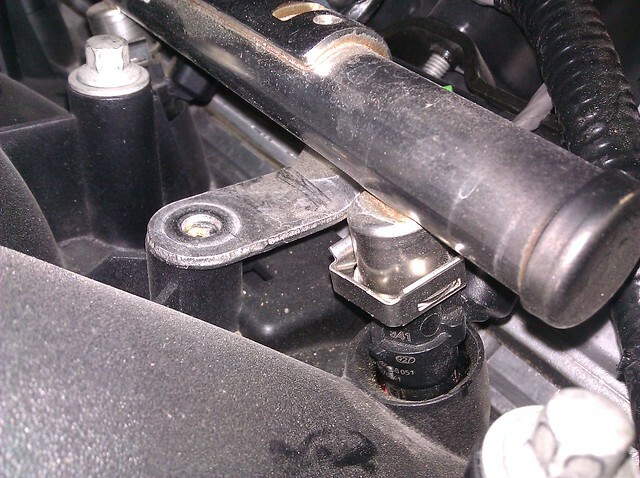 Make sure you do not over-tighten, or you may be extracting a broken bolt, or replacing a cracked manifold! A torque wrench is highly advised, but if a torque wrench is absolutely not available, tighten them to about the same tightness as they were previously, which is barely hand-tight, with a 1/4" ratchet. 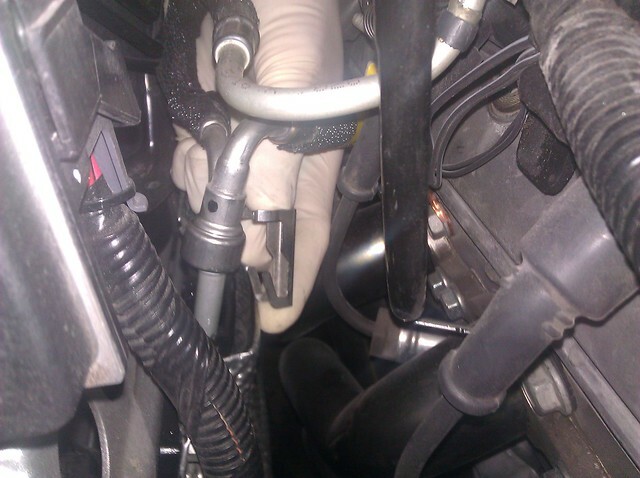 Now disconnect the engine side of the evap line that runs from the engine to the passenger frame area, next to the main fuel line. 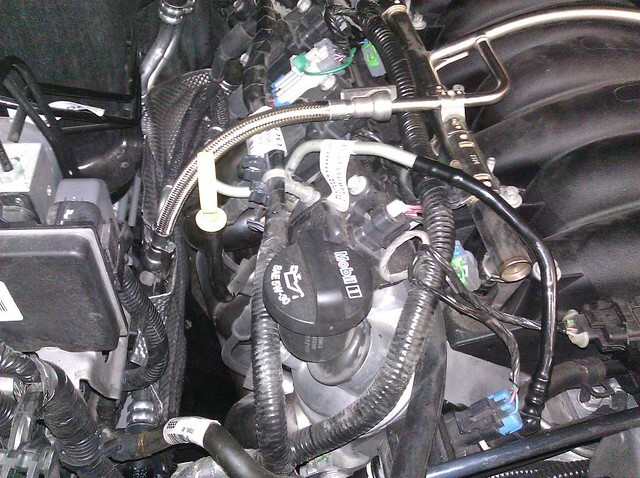 On the engine side, push the hose in further down, push the white tabs in, and pull the hose off. 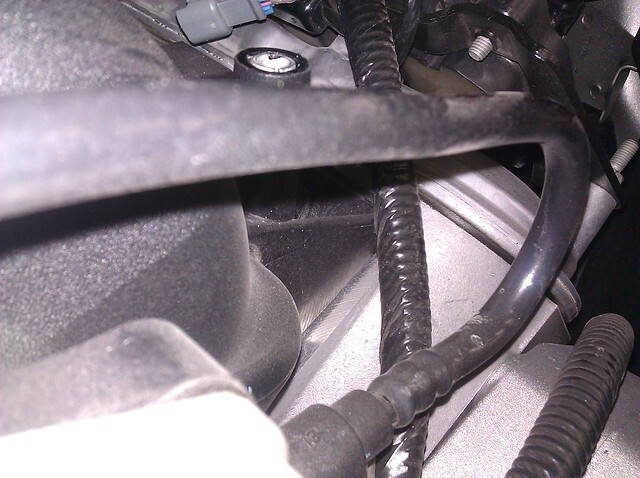 Pop off the tab which holds the wiring harness which sits over the coils on the passenger side, and route the evap hose underneath it, then reconnect the tab, and reconnect the evap hose on the engine side. 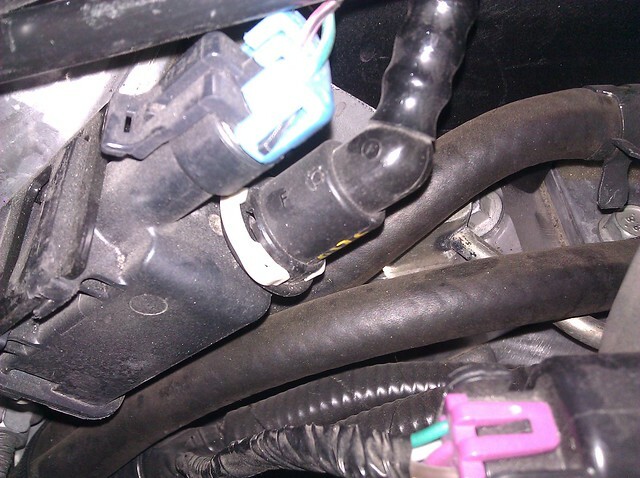 We want the evap hose underneath that wiring harness, so it sits away from the new fuel line, in case it rubs through. 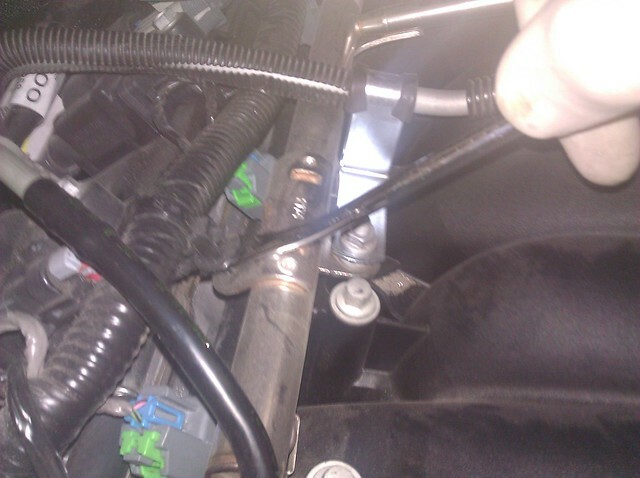 Now take the new fuel line, and connect it to the fuel rail, and the main fuel line, then install both lock clips. Now prime the fuel by turning the ignition on, but do not start the engine! 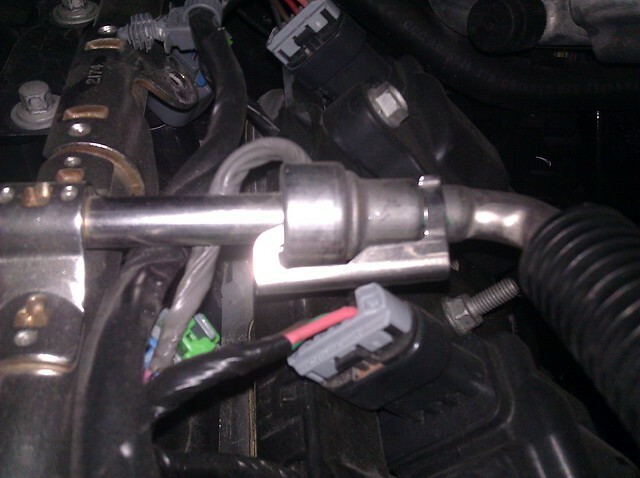 With the ignition on, inspect the fuel rail, line, and each injector (top and bottom) for any leaks. Turn the ignition off for a few seconds, and repeat. 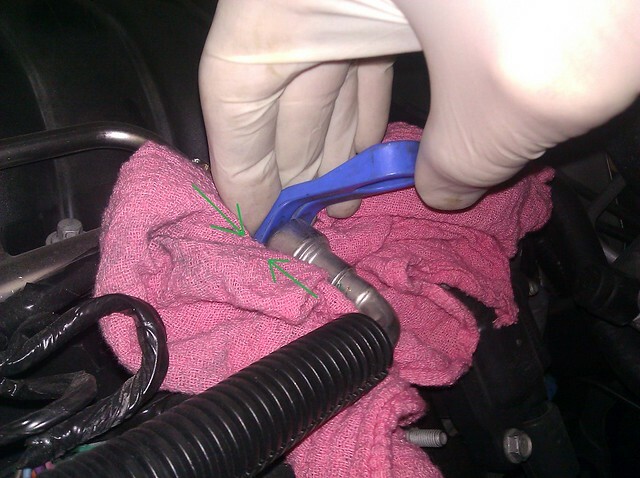 Do this 2 or 3 times, and if no leaks are present, you are good to start the engine. Make sure you have a good fire extinguisher or water readily available, just in case. 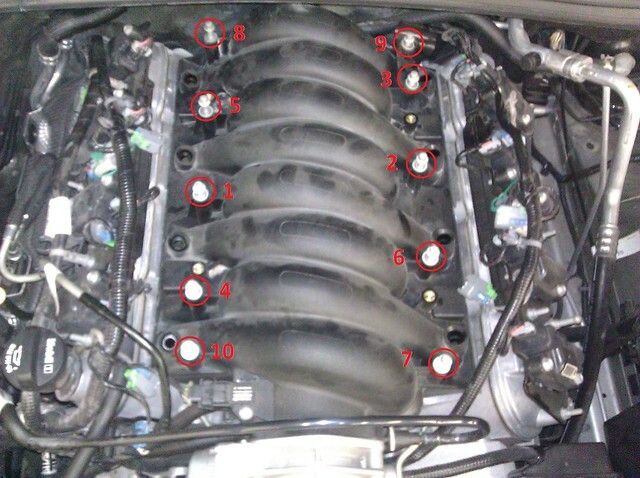 While the engine is running, again inspect for any leaks. Now ready, set, you're done! If you need any help, or have questions, feel free to call, PM, or email us anytime! When performed correctly, and as shown, no problems should occur. However, JDP Motorsports is in no way responsible for any damage or injury received or produced by following these instructions.